LONDON — With every smartphone brand applying the 18:9 and wider aspect ratio screens to its newer models, the rate of adoption is expected to quicken in the second half of 2018. 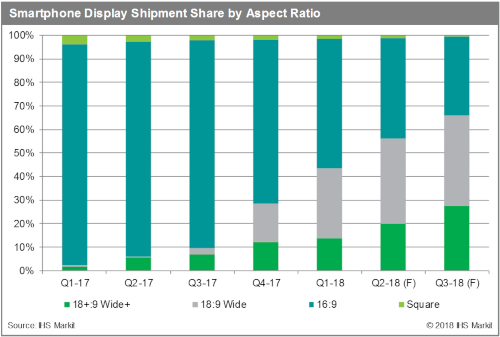 Smartphones using 18:9 and wider aspect screens are forecast to increase to 66 percent of total smartphone shipments in the third quarter of 2018, soaring up from 10 percent in the same period last year, according to business information provider IHS Markit (Nasdaq: INFO). After Samsung Electronics and Apple released their phones last year with new wider aspect ratios of 18.5:9 and 19.5:9, respectively, most smartphone brands have similarly followed suit by applying wider aspect screens to their 2018 lineup to keep up with product differentiation. Improvements in display technologies have hastened the expansion of the wider screen adoption in smartphones. Initially, flexible active-matrix organic light-emitting diode (AMOLED) technology was required to realize a full-screen display, and thus, 18:9 or wider screens were expected predominantly to be used in premium and high-end smartphones in 2018. However, with rapidly improving designs in liquid crystal display (LCD) cell structure, thin-film transistor (TFT) array and light-emitting diode (LED) backlight, TFT LCD can now be used in full-screen smartphones. “With the improvement in TFT LCD technology, smartphone makers are now aggressively applying 18:9 aspect ratio of TFT LCD to their 2018 models even for mid-end and entry-level smartphones, instead of using high-priced flexible AMOLED panels,” said Hiroshi Hayase, senior director at IHS Markit.